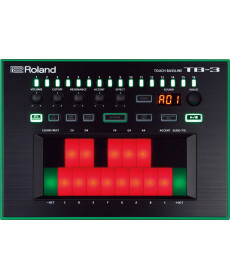 Groovebox Roland TB-3. Controladores: Touchpad; Cutoff knob; Resonance knob; Accent knob; Effect knob. 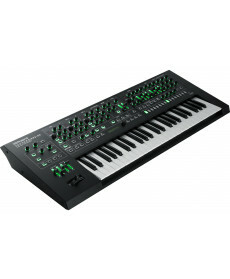 Sons: Instruments Preset Patches: 134; . Memória: User Patterns: 64; Maximum Step: 32 Steps (each pattern). Display: 7 segments, 3 characters (LED). USB: USB port: USB type B (Audio/MIDI) DC IN jack. Midi: MIDI (IN, OUT) connectors; USB. Sistema: Tecnologia Analog Circuit Behavior (ACB). Sintetizador Roland System-1. 622 Teclas. Controladores: VOLUME; TEMPO ; PORTAMENTO ; LEGATO button; PITCH BEND/SCATTER jog dial ; SCATTER TYPE dial ; KEY HOLD; OCTAVE UP/DOWN ; MOD ; Power Switch (painel traseiro). 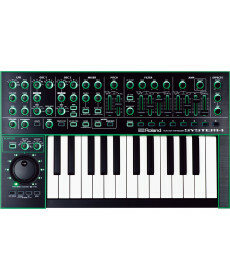 Sons: Oscillator Section, Filter Section, Amplifier Section, LFO Section, Mixer Section, Effecter Section; Maximum Polyphony: 4 voices (SYSTEM-1 Mode). Memória: User Memory: 8. Display: 7 segments, 3 characters (LED). USB: USB port: USB type B (Audio/MIDI) DC IN jack. Midi: MIDI (IN, OUT) connectors; USB. Sistema: Tecnologia Analog Circuit Behavior (ACB). 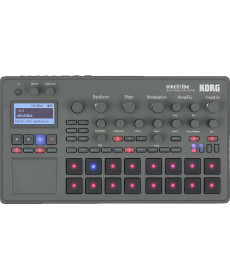 Music Production Korg Electribe. 622 Teclas. Controladores: VOLUME; TEMPO ; PORTAMENTO ; LEGATO button; PITCH BEND/SCATTER jog dial ; SCATTER TYPE dial ; KEY HOLD; OCTAVE UP/DOWN ; MOD ; Power Switch (painel traseiro). Sons: Oscillator Section, Filter Section, Amplifier Section, LFO Section, Mixer Section, Effecter Section; Maximum Polyphony: 4 voices (SYSTEM-1 Mode). Memória: User Memory: 8. Display: 7 segments, 3 characters (LED). USB: USB port: USB type B (Audio/MIDI) DC IN jack. Midi: MIDI (IN, OUT) connectors; USB. Sistema: Tecnologia Analog Circuit Behavior (ACB). Groovebox Roland TR-8. 622 Teclas. Controladores: VOLUME; SCATTER; TEMPO; FINE; SHUFFLE; PADS: 16; MODE: 6; CLEAR; VARIATION: A, B; SCALE; LAST STEP; START/STOP; SCATTER ON; SCATTER DEPTH; TAP; Power Switch (Rear). Pads: 16 full-color. Sons: BASS DRUM (controlos: LEVEL, TUNE, ATTACK, COMP, DECAY, INST SELECT), SNARE (controlos: LEVEL, TUNE, SNAPPY, COMP, DECAY, INST SELECT), LOW, MID and HIGH TOMS, RIM SHOT, HAND CLAP, CLOSED/OPEN HIHAT, CRASH, RIDE (controlos:LEVEL, TUNE, DECAY, INST SELECT). Memória: User Drum Kits: 16; User Patterns: 16. Display: 7 segments, 4 characters (LED). USB: USB: interface audio e midi. Midi: 1 x In; 1 x Out. Sistema: Tecnologia Analog Circuit Behavior (ACB). 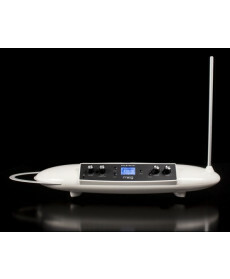 Sintetizador Moog Theremini. Efeitos: REVERB (controlos de LEVEL, TIME, GATE, STEP); DELAY (controlos de LEVEL, TIME, FEEDBACK, STEP); SIDE CHAIN; ACCENT (controlos de LEVEL, STEP); EXTERNAL IN (controlos de LEVEL, SIDE CHAIN, STEP). Controladores: VOLUME; SCATTER; TEMPO; FINE; SHUFFLE; PADS: 16; MODE: 6; CLEAR; VARIATION: A, B; SCALE; LAST STEP; START/STOP; SCATTER ON; SCATTER DEPTH; TAP; Power Switch (Rear). Display: 7 segments, 4 characters (LED). Sistema: Tecnologia Analog Circuit Behavior (ACB). USB: USB: interface audio e midi. Memória: User Drum Kits: 16; User Patterns: 16. MIDI: 1 x In; 1 x Out. Alimentação: 430. 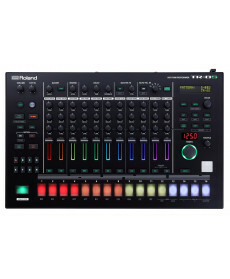 Groovebox Roland TR-8S. 622 Teclas. Controladores: VOLUME; SCATTER; TEMPO; FINE; SHUFFLE; PADS: 16; MODE: 6; CLEAR; VARIATION: A, B; SCALE; LAST STEP; START/STOP; SCATTER ON; SCATTER DEPTH; TAP; Power Switch (Rear). Pads: 16 full-color. Sons: BASS DRUM (controlos: LEVEL, TUNE, ATTACK, COMP, DECAY, INST SELECT), SNARE (controlos: LEVEL, TUNE, SNAPPY, COMP, DECAY, INST SELECT), LOW, MID and HIGH TOMS, RIM SHOT, HAND CLAP, CLOSED/OPEN HIHAT, CRASH, RIDE (controlos:LEVEL, TUNE, DECAY, INST SELECT). Memória: User Drum Kits: 16; User Patterns: 16. Display: 7 segments, 4 characters (LED). USB: USB: interface audio e midi. Midi: 1 x In; 1 x Out. Sistema: Tecnologia Analog Circuit Behavior (ACB). 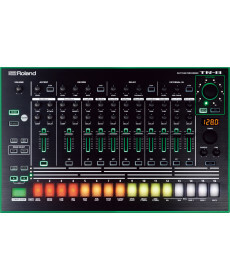 Born of the most famous and influential drum machines ever made, the TR-8S combines the best of its Roland heritage with modern production techniques and professional sound design.